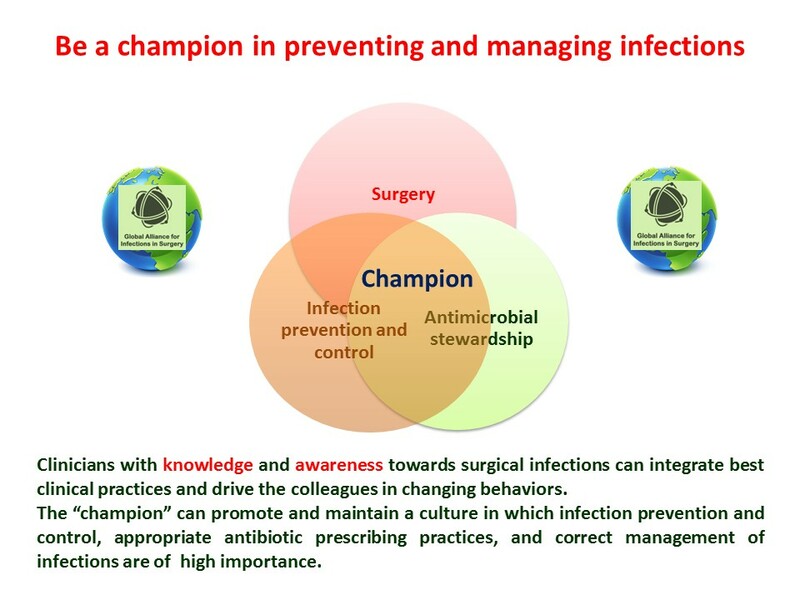 To be a champion in preventing and managing infections in surgery means creating a culture of collaboration in which infection prevention, antimicrobial stewardship and correct management of infections are of high importance. Patient safety is described the absence of preventable harm to a patient during the process of health care and reduction of risk of unnecessary harm associated with health care to an acceptable minimum. Improving patient safety in today’s hospitals worldwide also requires a systematic approach to combating healthcare-associated infections (HAIs) and antimicrobial resistance (AMR). The two go hand-in-hand. The occurrence of HAIs such as central line-associated bloodstream infections, catheter-associated urinary tract infections, surgical site infections, hospital-acquired/ventilator associated pneumonia and C. difficile infection, continues to escalate at an alarming rate. These infections develop during the course of health care treatment and result in significant patient illnesses and deaths (morbidity and mortality); prolong the duration of hospital stays; and necessitate additional diagnostic and therapeutic interventions, which generate added costs to those already incurred by the patient’s underlying disease. HAIs are considered an undesirable outcome, and as many are preventable, they are considered an indicator of the quality of patient care, an adverse event, and a patient safety issue. There is sometimes a false impression that HAIs are adequately controlled. However, with multidrug-resistant bacteria increasing, such as Methicillin-resistant Staphylococcus aureus (MRSA), vancomycin-resistant enterococci (VRE), carbapenem-resistant Enterobacteriaceae (CRE), such infections are more than ever a public health threat. It is well known that HAIs tend to show higher resistance rates to antibiotics than community-acquired infections. Patients in hospitals are often exposed to multiple risk factors for acquisition of multidrug-resistant bacteria. Acute care facilities, are important sites for the development of AMR. The intensity of care together with populations highly susceptible to infection create an environment which facilitates both the emergence and transmission of resistant organisms. The spread of multidrug-resistant bacteria from one person/patient to another most often occurs when someone who is colonized with resistant bacteria, but not ill, transmits them to another person, who then also becomes colonized. The bacteria may for example be carried on the person’s skin (as is most common with MRSA) or in the bowel (as is most common with various ESBL-producing bacteria or vancomycin-resistant enterococci and carbapenem-resistant Enterobacteriaceae). Colonization by multidrug-resistant bacteria does not necessarily have to happen at the time of the infection, they may sit silently doing no harm. Moreover the surgical department represents one of the most sizable challenges to infection prevention and control. Patients with medical devices (central lines, urinary catheters, ventilators) or who undergo surgical procedures are at risk of acquiring HAIs. Surgical site infections are the most common type of hospital-acquired infections in the surgical departments worldwide. Optimal infection control programs have been identified as important components of any comprehensive strategy for the control of AMR, primarily through preventing HAIs and limiting transmission of resistant organisms among patients. The successful containment of AMR in acute care facilities, however, also requires an appropriate antibiotic use. It is well known that ASPs significantly improve patients’ outcome reducing the incidence of infections with antibiotic-resistant bacteria and C difficile infections in hospital inpatients, making antimicrobial stewardship an important synergistic HAI prevention and control strategy. Infection prevention and antimicrobial stewardship share the common goal to keep patients safe and to improve patient outcomes. Leading international organizations, such as the WHO, acknowledge that collaborative practice is essential for achieving a concerted approach to providing care that is appropriate to meet the needs of patients, thus optimizing individual health outcomes and overall service delivery of health care. The use of such approaches reinforces the concept that each one brings with them their particular expertise and is responsible for their respective contributions to patient care. Collaborative clinical efforts can help to prevent preventable HAIs. When HAIs occur, collaborative clinical efforts can help to manage appropriately them and make the appropriate choice of antibiotic, regimen, dosing, duration and route of therapy. In this context it is essential the role of infectious diseases specialist. Pharmacists with advanced training or longstanding clinical experience in infectious diseases are also key actors for the design and implementation of the stewardship program interventions. In any healthcare setting worldwide, a significant amount of energy should be spent on infection prevention and control. Infection control specialists, healthcare specialists and hospital epidemiologists should be always included in these programs to coordinate efforts on monitoring and preventing healthcare-associated infections. Microbiologists should actively guide the proper use of tests and the flow of laboratory results. Being involved in providing surveillance data on antimicrobial resistance, they should provide periodic reports on antimicrobial resistance data allowing the multidisciplinary team to determine the ongoing burden of antimicrobial resistance in the hospital. Moreover, timely and accurate reporting of microbiology susceptibility test results allows selection of more appropriate targeted therapy, and may help reduce broad-spectrum antimicrobial use. Infections are the main factors contributing to mortality in intensive care units (ICU). Intensivists have a critical role in treating multidrug resistant organisms in ICUs in critically ill patients. They have a crucial role in prescribing antimicrobial agents for the most challenging patients and are at the forefront of successful antibiotic prescribing policies. Emergency departments (EDs) represent a particularly important setting for addressing inappropriate antimicrobial prescribing practices, given the frequent use of antibiotics in this setting that sits at the interface of the community and the hospital. Therefore, ED practitioners should be involved too. Without adequate support from hospital administration, these programs will be inadequate or inconsistent since the programs do not generate revenue. Engagement of hospital administration has been confirmed as a key factor for both developing and sustaining. Surgeons are at the forefront in preventing and managing infections. Surgeons are responsible for many of the processes of care shown to impact the risk for surgical site infections, and play an important role in their prevention. Surgeons are also at the forefront in managing patients with surgical infections, who often need immediate and adequate antimicrobial therapy and are directly responsible for their outcome. Their leadership in the multidisciplinary efforts to improve the quality of the surgical patient is of critical importance. Surgeons with adequate knowledge in surgical infections when involved may audit both antibiotic prescriptions and prevention practices, integrate best practices among surgeons, and act as champions among colleagues implementing change within their own sphere of influence. Finally, an essential participant who has been often unrecognized and underutilized is the “staff nurse.” Although the role of staff nurses has not formally been recognized in guidelines they perform numerous functions that are integral to successful. Education is crucial in improving healthcare workers behaviors towards HAIs. Effective prevention and management of HAIs is a process requiring a fundamental understanding of the evolving relationship between inappropriate prevention and management and prevalence of HAIs and emergence of AMR. However, because medical professionals have already established their knowledge, attitudes, and behaviors, it is difficult to change their deeply established views and behaviors. Efforts to improve educational programs are required and it is necessary that every hospital worlwide develops appropriate educational programs to drive healthcare workers towards correct behaviors in the prevention and management of HAIs. The purpose of training and educating healthcare professionals should be to ensure both individual understanding and a team approach with shared knowledge, skills and attitudes towards the prevention and management of HAIs. 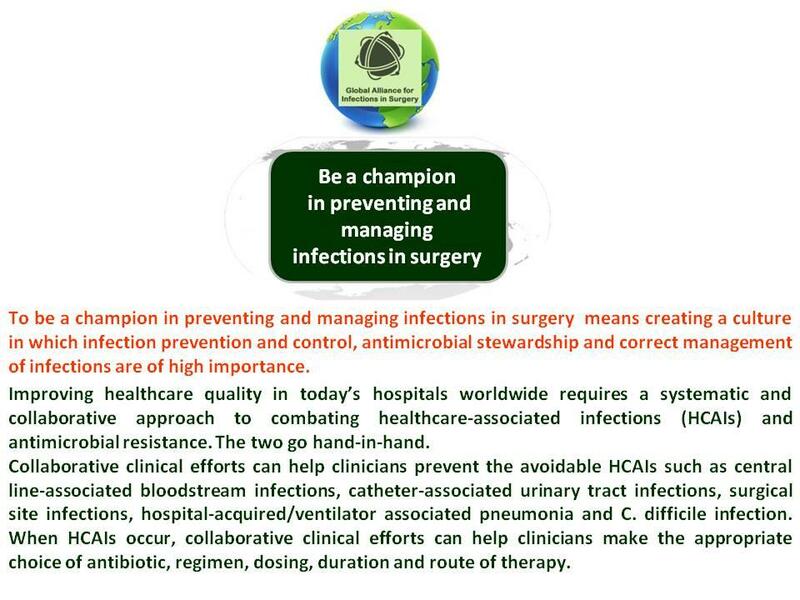 The vital work of infection control and prevention, antimicrobial stewardship and correct approach to surgical infections cannot be performed independently and requires interdependent and coordinated action across multiple and overlapping disciplines and clinical settings. 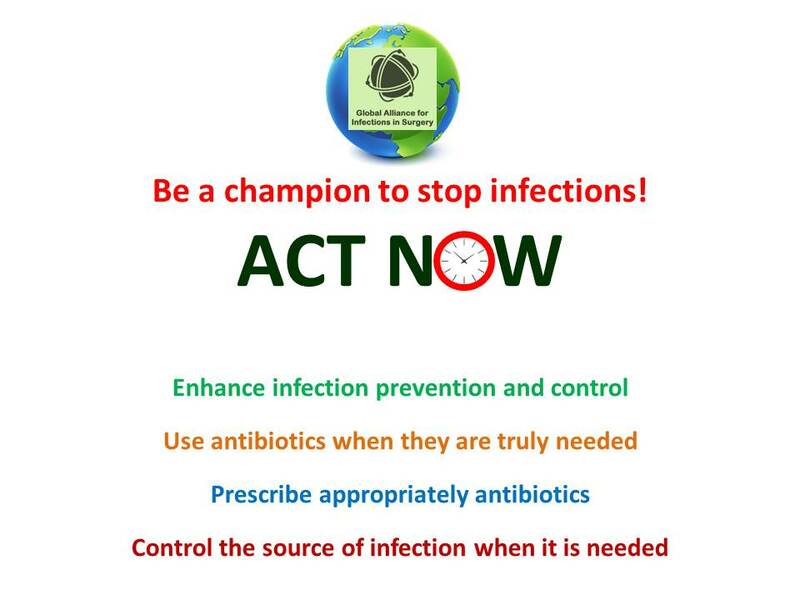 keeping patients safe from infection and ensuring that effective antibiotic use is available for future generations should be based, on collaboration between all healthcare professionals in order to gain the wider-possible acceptance, share knowledge and spread best clinical practices.